I don't know much about this frame, other than that in is an improvement on the 979. If you have more details I can add, please email me. The Vitus 992 is an updated version of the bonded-lug construction of the Vitus 979. The tubes and lugs are slightly shaped instead of the purely round tubes used on the 979. 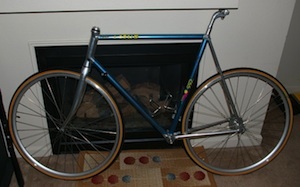 The shaping is particularly noticable on the head tube, the top tube, and the down tube. The 992 also uses what was then considered an oversized headset. The internal cable routing is cleaner than was used on the 979. I had previously misidentified this picture of Sean Kelly on a Vitus as a 979. It is a 992. (Thanks, Kevin) If you look carefully, you can see the tubes are shaped slightly differently from the 979.